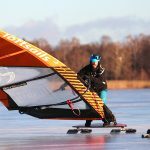 The new iceboard world record (inofficial) was set on the Swedish lake Glan outside Norrköping – Sweden by Henrik Mård S414. 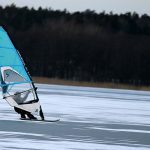 The new record speed, windsurfing on ice, 53.96 knots (average 5*10 sec) was set on his three blade Mårdboard 3.1 and Gaastra Vapor 5.0. 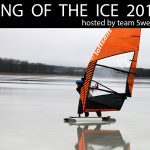 The world record is yet to be verified by gps-icesailing.com. 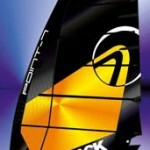 The old record 52.65 knots was set 2012 by Jeff Brown – United States. 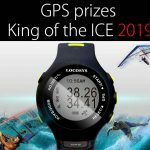 Update: Henrik Mårds world record was not accepted as the official world record since Henrik´s two GPS units wasn´t identical. 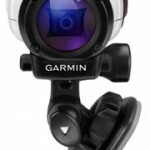 Henrik used a Locosys GT-31 and GPSLogit (mobil app for android). 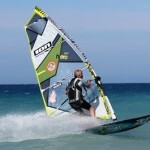 Henriks top speed during the session was impressive 58.98 knots (2 sec). 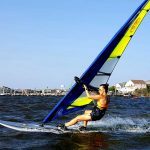 Check out his video from the record session. 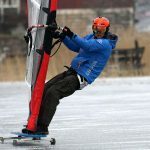 Also check out his session on gps-icesailing.com.